Carvana offers a fully integrated way to buy a second hand car online or via an app. The cars are delivered shortly after using Carvana-owned logistics. You can also pick up a car from one of 15 vending machines in highly visible locations and not even have to speak to anyone. Processes around trade-ins, financing, and servicing contracts are all automated. Many of these features are intrinsically superior to the existing dealer experience. Carvana can hold more inventory, can adjust it according to customer data, and can scale in a way that a traditional dealership fixed at a fixed location, servicing a local market, can not. That the user experience is superior is not speculation on our part - the firm grew revenues organically by over 120% over the past 12 months to nearly US$2 billion, and they only cover about 60% of the United States. This year, Carvana recently opened in New York, which may explain the large lift in traffic over the past few weeks. We tentatively suggest bodes well for March 2019 results. This has not been due to a surge in US second hand car demand, as it has been a poor market for autos generally. So why is Carvana’s approach proving so compelling? The firm offers a 7 day return policy, effectively a long test drive. There is a 100 day warranty, which reduces buyer's inertia and the fear of landing a dud. Carvana also guarantees their cars haven't been in an accident. Most of all, you don’t need to speak to a car salesman, and can make the decision from the comfort of your own home, in your own time. The stock has (also) had a wild run, trading up to 6x sales in mid 2018. We first purchased at $36, when the stock had roughly halved from its peak. Over that period revenue increased from $1.3 billion to $2.0 billion, so the multiple compressed even more. 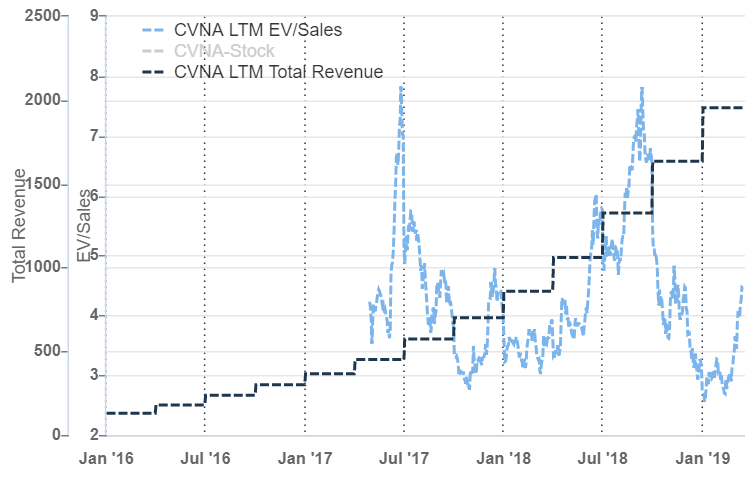 Carvana's Total Revenue (black dotted line) and EV/Sales, using enterprise value and trailing 12 month sales. We don’t use sales multiples to actually value companies, but they can be more illuminating than stock prices, which don’t reflect changes the underlying company (in this case rapid sales growth). The chart above shows broadly what we are looking for: a steady increase in fundamentals that we can ride for several years. Now that we’ve entered at an attractive price on an absolute and relative basis, we’ll ignore the inevitable impending price volatility. Most of their gross profit comes from financing and selling vehicle service contracts and the like. Some have raised this as a negative - but we actually like the approach, as it makes competing very difficult. Carvana’s striking operating leverage is evident along all key cost items, which have steadily declined as a percentage of revenue. The firm has achieved a ~2% market share in their original market. 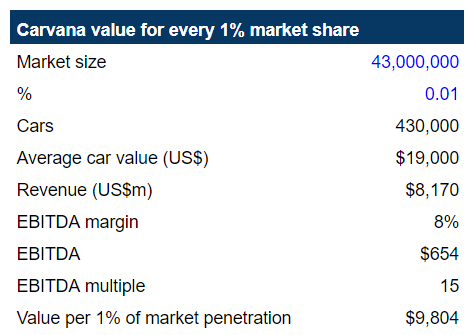 Carvana is targeting an 8-15% final EBITDA margin, and given the operating leverage shown above, 8% seems possible. This is in line with listed traditional dealerships. The second hand auto market is enormous - about 21% of all retail, and one of the few areas untouched by the technology giants. The biggest US dealership has only 1.8% of the market. If so, a simple calculation shows the company could be worth $10 billion for every 1% market penetration they achieve, vs our initial purchase valuation of ~$5 billion. The firm is issuing equity to fund growth, but minor dilution for >100% growth is worth paying. 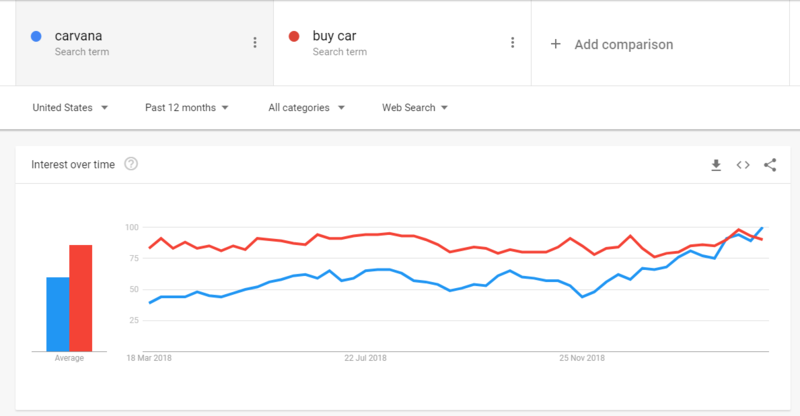 There's significant short interest as investors positioned for a downturn in US autos, as well as governance risk, as the founders exercise full control. The firm was spun out of their auto dealership, and there are continued commercial relationships. In our own fund, we have partly hedged this risk with by shorting the US retail index. The short interest is over 50% of the free float. We believe high short interest is part of the opportunity, as when the price rises, shorts with risk management processes in place will be forced to buy their shorts back. Carvana’s genesis from an actual dealership is a positive, in our view, as it will be hard for the US tech companies like Amazon to enter the space without the expertise and infrastructure. In fact, if they did so, they might well decide to buy Carvana. There have been plenty of attack pieces written on the firm, which you'll be able to find on the internet. The management team has done exactly what we’d like them to do in such situations: keep quiet, release additional information where required, and grind out operating performance to force the shorts to buy back at higher and higher prices. Many of these reports have aged badly. We noticed a similar dynamic in place in Afterpay, where short interest rose during a period where we actually gained higher conviction, and sure enough, as the operating updates rolled in, the stock reacted explosively to the upside. 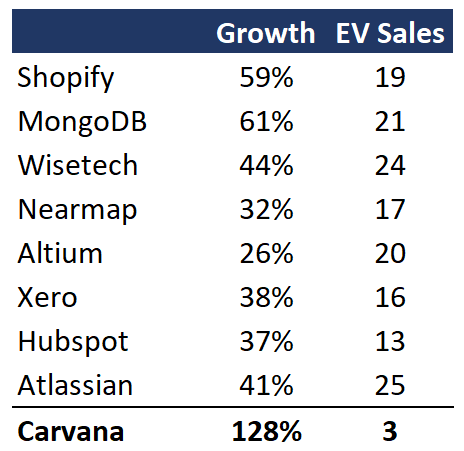 In a weak market, Carvana is demonstrating some of the highest organic growth rates we've seen in a company this size, in a completely fragmented market, that's relatively immune from an attack by Amazon. There is plenty of upside for the risk on offer here.